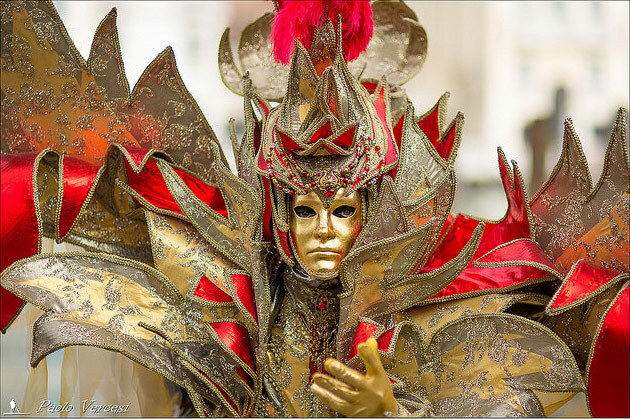 Venice carnival. Photo by Paolo Vercesi. Carnival is celebrated in many cities of Italy, with celebrations usually starting on the first Sunday of February and lasting until the end of February or the beginning of March. The most famous Carnival of all is, of course, the Carnival of Venice. It starts during the last week of January and ends 40 days before Easter, on Mardi Gras, the day before Ash Wednesday. 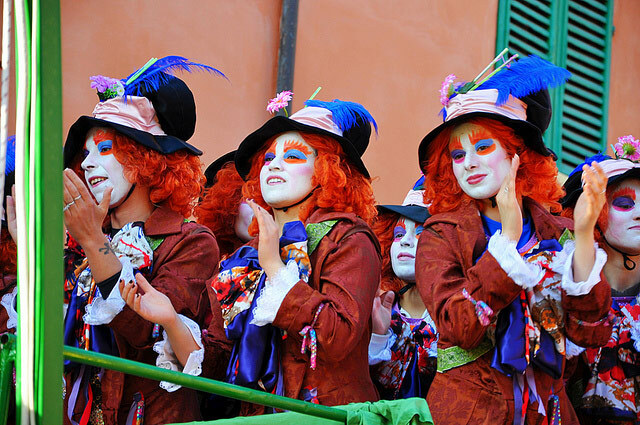 Other important Italian carnivals include the ones in Viareggio and in Fano, the latter being one of the oldest carnival of Italy, first attested in 1347. 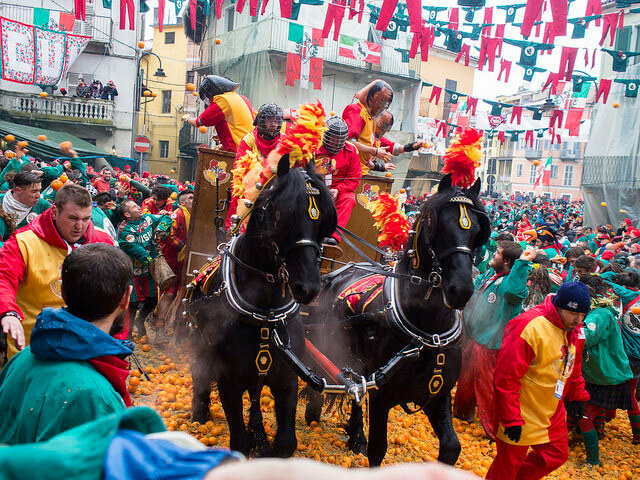 One-of-a-kind is the Carnival of Ivrea, with its ‘Battle of the Oranges’. This peculiar celebration involves the townspeople, divided into nine combat teams, who throw oranges at each other during the traditional carnival days. 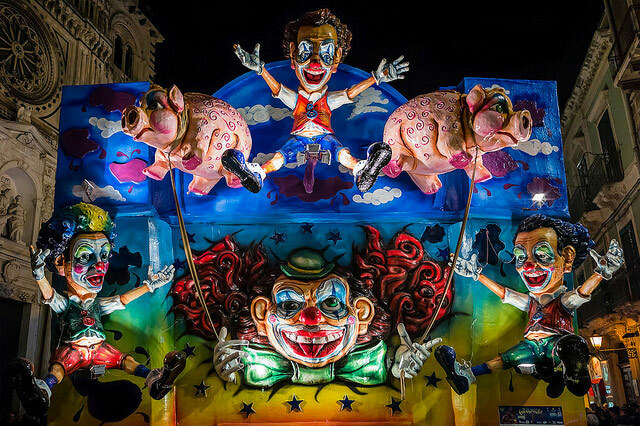 Then there is also the colorful carnival of Acireale in Sicily, renowned as being the most beautiful of Sicily, and the carnivals of Putignano, Cento, Verona, Sciacca and Milano. Without doubt the carnival of Venice is the most famous of Italy and maybe of Europe. It is believed that the Venetian carnival tradition started in 1162 with the celebration of the victory of Doge Vitale Michele II over the patriach Ulrico of Aquileia, which led to festivities on San Marco square. 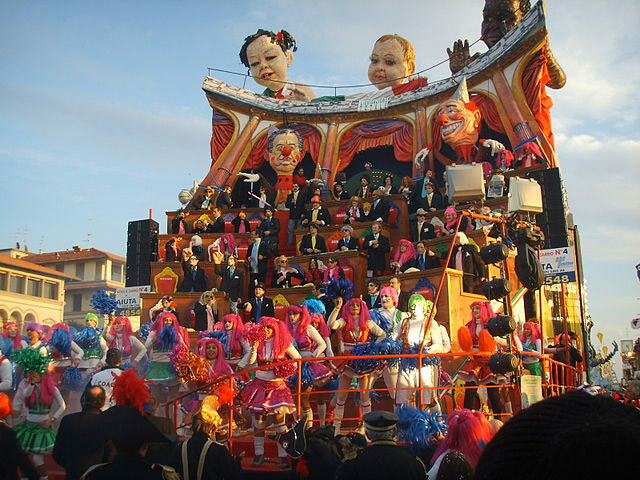 However, the position of oldest carnival of Italy is disputed by the carnival of Fano (see below). 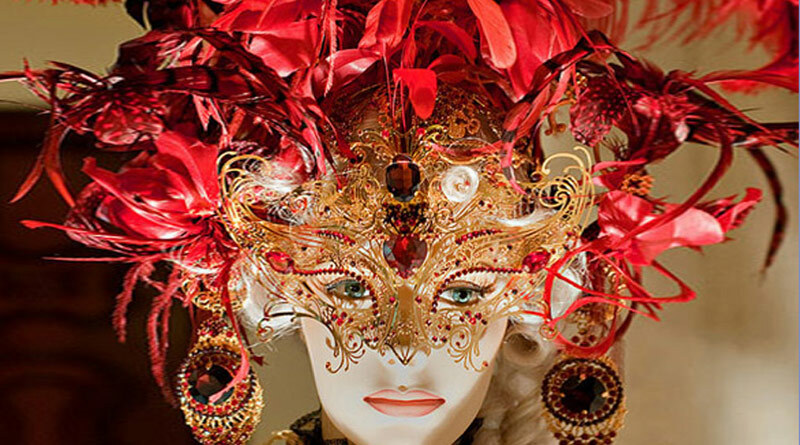 Masks have always been an essential component of the Venetian carnival. Carnival started as a time for celebration where all social classes would mingle, and wearing a mask allowed people to remain anonymous. See more at: Types of Venetian masks. Of course, this also led to excesses and facilitated criminal behavior. The subversive nature of the carnival is reflected in the myriad of laws created over the centuries in Italy in an attempt to restrict celebrations and ban the wearing of masks in specific cases. See more at: Types of Venetian masks. 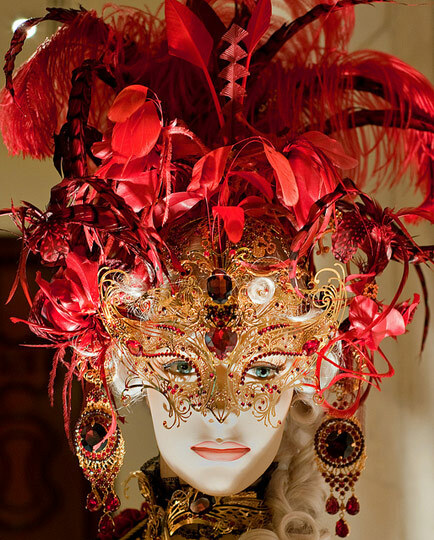 Originally Venetian masks were made of leather, porcelain or glass and had a practical or symbolic function. 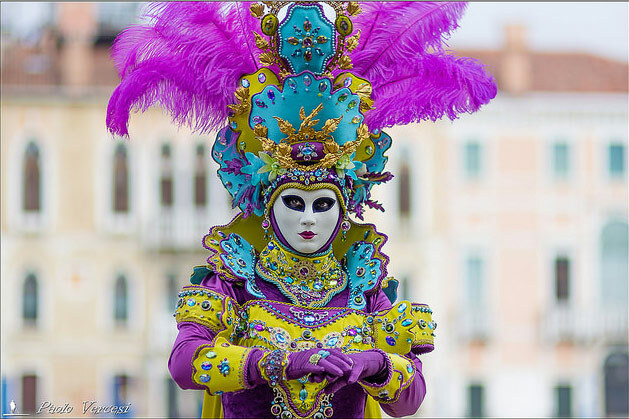 The main types of Venetian masks were the bauta, moretta, gnaga, medico della pesta, scaramuccia, pantalone, arlechino, colombina, but today’s costumes often combine elements of various origins. See more at: Types of Venetian masks. Mask makes (mascareri) enjoy a unique status as registered artisans, organised in their own guild since 1436. 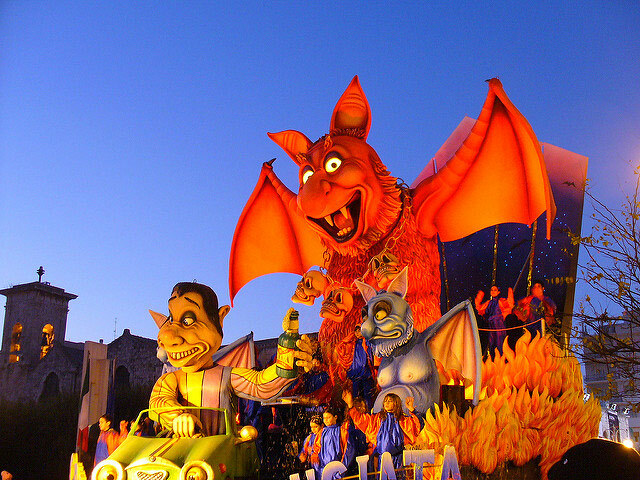 Carnival of Viareggio. Photo by Saiko. 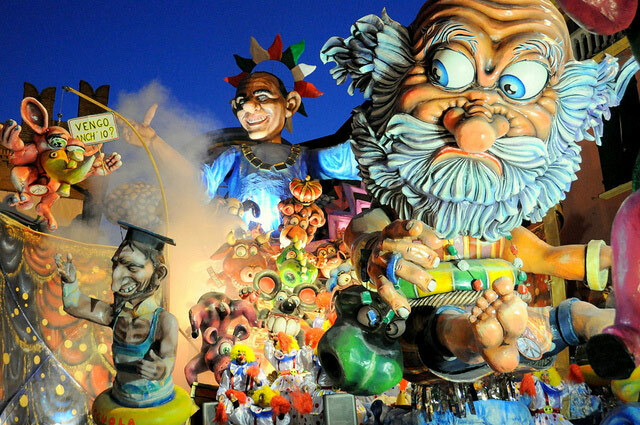 The Viareggio carnival is probably the second famous of Italy, renowned for its giant allegorical floats (carri) and authentic art works made of paper-pulp (cartapesta) depicting caricatures of popular people, such as politicians, showmen and sportsmen. It lasts one month with night and day celebrations. Viareggio Carnival. Photo by Giulia. 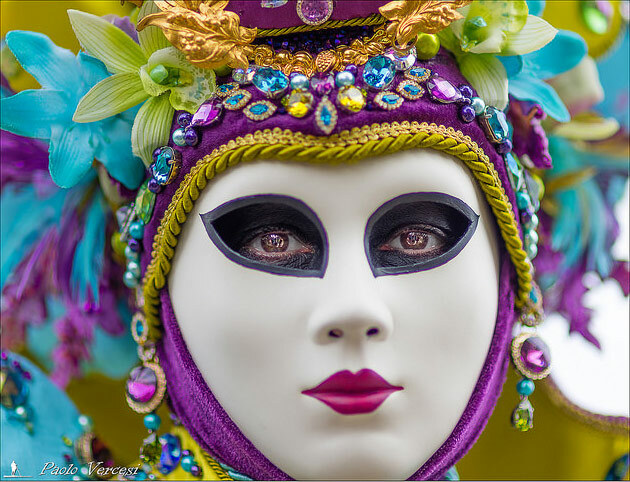 The first carnival parade in Viareggio was held in 1873 as a sign of protest, when aa few wealthy middle-class men decided to organize a parade with floats, wearing masks in order to show their refusal of high taxes they were forced to pay. 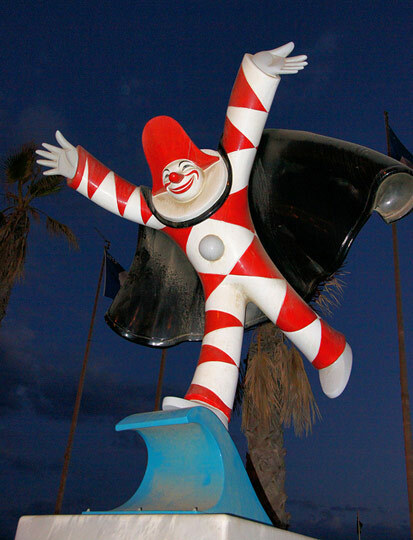 The burlamacco, official mascot of the Viareggio carnival. Photo by Chris Sampson. The official local mask is il Burlamacco, first depicted in 1931 by Uberto Bonetti. The name stems from the Burlamacca river and the red and white striped outfit from the traditioal colors of the umbrellas on the beach of Viareggio. Fano carnival. Photo by Patrizia. 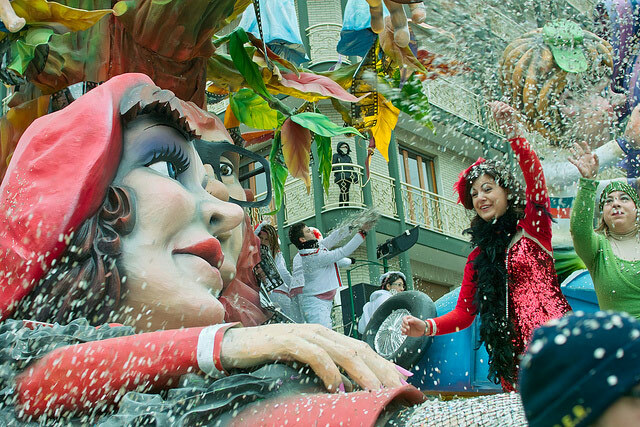 The carnival of Fano is the oldest carnival of Italy, first attested in 1347. 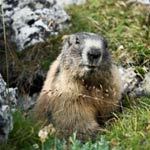 Legend has it that the tradition began on the occasion of the reconciliation between two respectable families of the time, the Del Casseros and the Da Carignanos. 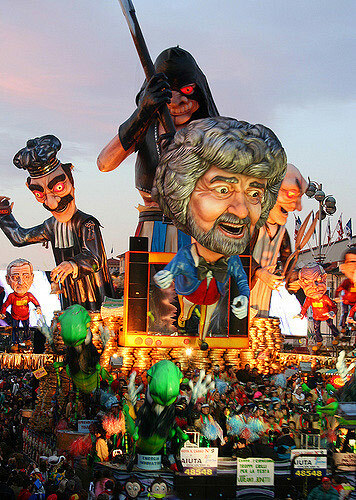 The Fano Carnival is also said to be the world’s “sweetest” carnival, as the crowds of visitors are showered with sweets, caramels and chocolates coming form the parade of allegorical floats. The procession ends with a wonderful light and color show. Or, as the Fano Carnival slogan says: bello da vedere, dolce da gustare, or beautiful to see, sweet to taste. Photo by Leandro Neumann Ciuffo. 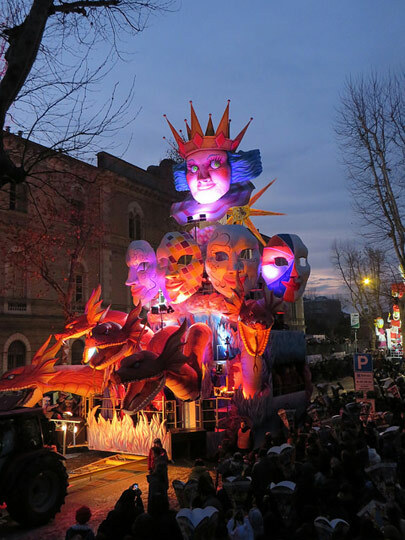 Known as the “most beautiful carnival of Sicily”, the carnival of Acireale attracst visitors from all over the world for its beautiful parade with spectacular floats and costumes proceeding through the baroque city. Ivrea carnival. Photo © Mascava. 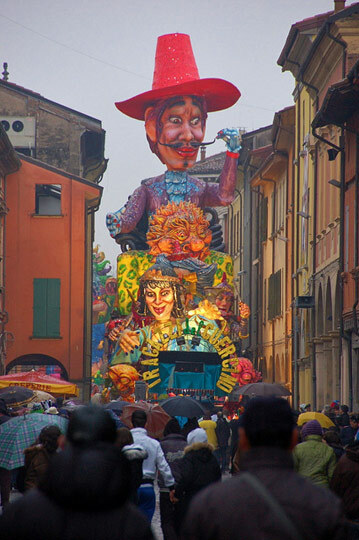 The historic carnival of Ivrea is known as the Orange throwing carnival (Battle of the Oranges). Thousands of townspeople, divided into nine combat teams, throw oranges at each other during the traditional carnival days: Sunday, Monday and ending on the night of “Fat Tuesday” with a solemn funeral. Visitors are encouraged to purchase and wear a red hat, the Berretto Frigio (Phrygian Cap) for protection at all times. People wearing a red hat will not be considered part of the revolutionaries, and therefore will not have oranges thrown at them. Characteristic of the carnival parade of Cento is the generous “showering” of the visitors with presents, cuddy toys, balls and all sorts of gadgets. 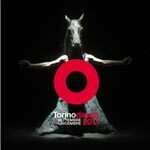 Since 1993, The town of Cento is twinned with the Carnival of Rio de Janiero. Cento carnival. 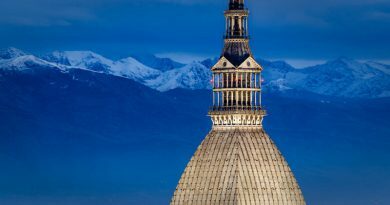 Photo by mfortini/Turismo Emilia Romagna. The town of Putignano is also well known for its Carnival, considered one of the main carnivals in Italy since it is the longest (it starts the day after Christmas and finishes the day before the ash Wednesday) and the second oldest (dated from 1394). 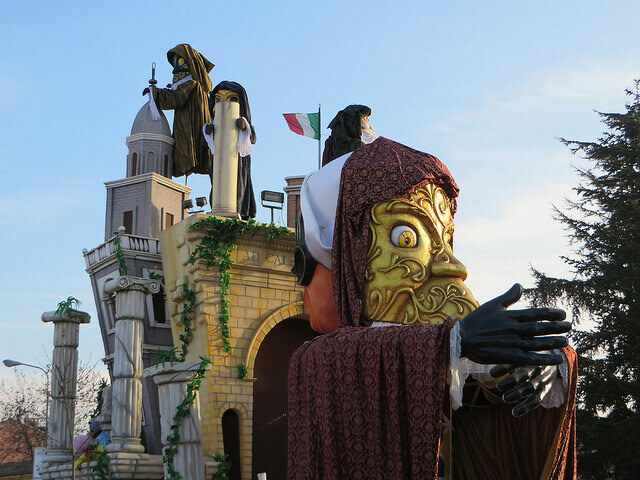 The carnival in Verona is celebrated with a parade of allegorical floats (carri allegorici) on the “Venerdi Gnocolar”, which takes place on the last Friday of Carnival, when people eat traditional potato gnocchi. Papà del gnoco. Photo by Marco Oliani. Every year, at the occasion of the carnival, a Papà del Gnoco (Gnoco daddy, the traditional first course) is being elected. The Papà del Gnoco is the main mask or character of the Verona carnival. He is represented as a ruddy old man with a long white beard and a fake belly full of gnocchi, dressed in beige brocade and a red cloak. 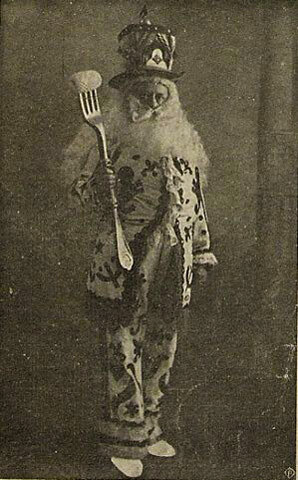 As he is considered the king of the Bacanal del Gnoco, he hold a scepter that looks like a giant fork on which a large potato gnoco is pinned. 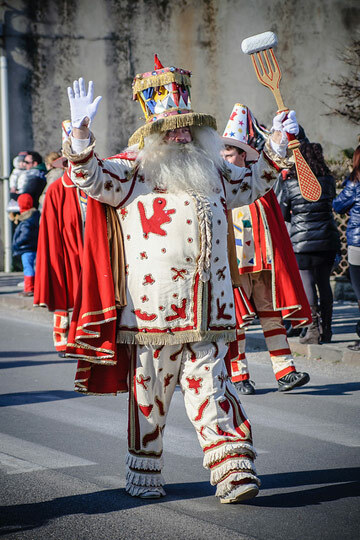 The Papà del Gnoco is the oldest carnival character that is attested by photographic documentation. Papà del gnoco. Photograph of the beginning of the 1900s. 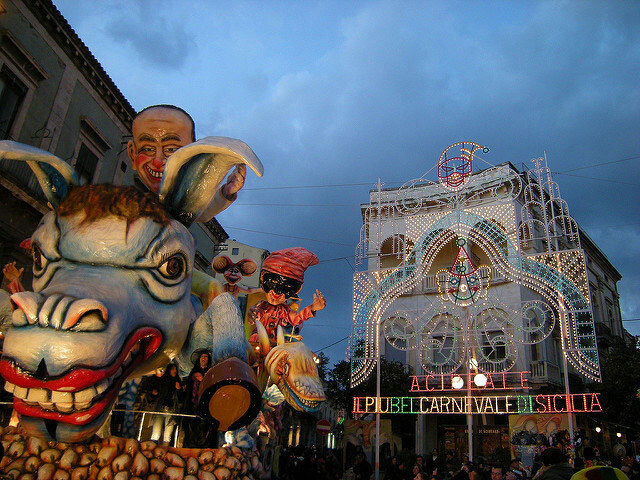 Sciacca’s carnival is celebrated during the week before the beginning of Lent (February). 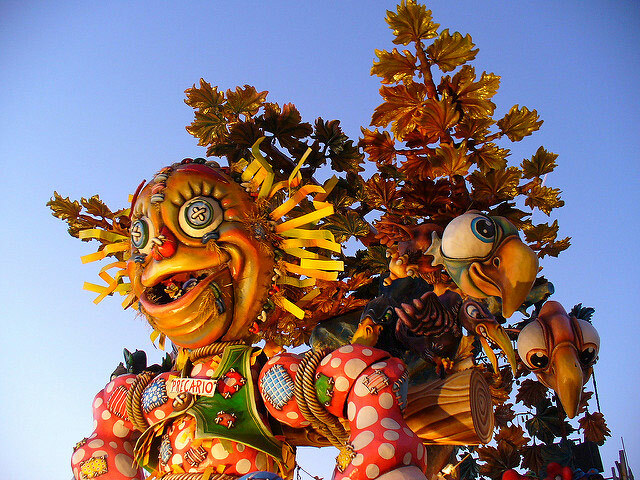 The festival is throughout Sicily for its parade of bizarre figures with extravagant expressions. 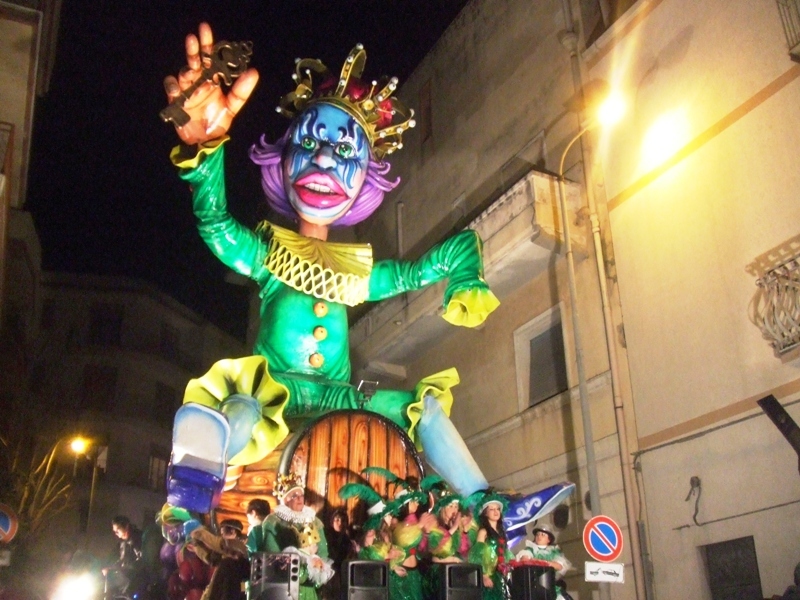 The most unique part of the carnival is the float of Peppe Nappa, the official mask of the carnival, or as they say in the local language “Lu Re di lu cannalivari sciacchitanu” (the King of the Carnival of Sciacca). 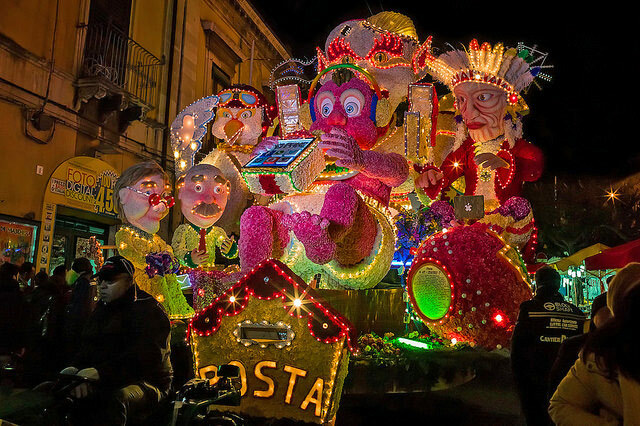 It is from the float of Peppe Nappa that candies, wine and sausages are being distributed to the crowd. 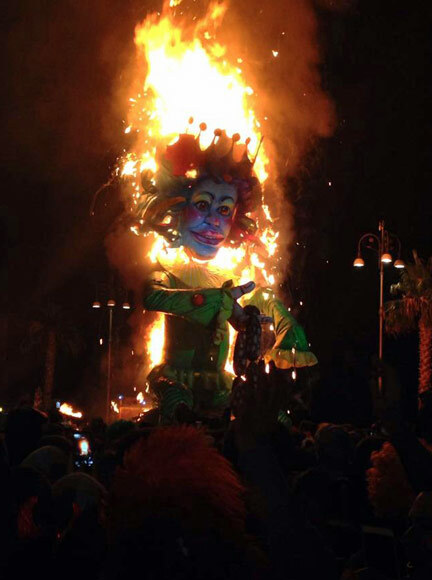 The clou and most dramatic part of the festival is when Peppe Nappa is being detached from its supporting structure and set on fire. In Milan carnival is referred to as Carnevale Ambrosiano (“Ambrosian Carnival”) and lasts four more days, ending on the Saturday after Ash Wednesday, because of the Ambrosian rite, named after Saint Ambrose, a bishop of Milan in the fourth century. Photo credits (from top to bottom): Venice by Paolo Vercesi; Venice by Louis Vest; Venice (2 photos) by Paolo Vercesi; Viareggio by Saiko and Giulia; Burlamacco by Chris Sampson; Fano (2 photos) by Patrizia; Acireale by Leandro Neumann Ciuffo and Alessandro Grussu (2 photos); Ivrea horses © Mascava; Cento (3 photos) by Turismo Emilia Romagna; Putignano by Roberto and Laurent; Papà del gnoco by Marco Oliani.